Last Fall she marked 30 years of service to WSU, and now she is looking forward to working on some of her favorite projects full-time. 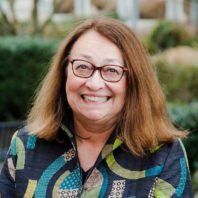 Dr. Candice Goucher is retiring as professor of history on the Vancouver campus, where she held various administrative positions since arriving at WSUV in 2000. She was the 2014-15 Trent R. Dames Fellow in the History of Civil Engineering at the Huntington Library, having studied chemistry and visual arts at the University of California, San Diego (BA, 1975), art history & Archaeology at Columbia University (MA, 1978), and African history at the University of California at Los Angeles (PhD, 1984). 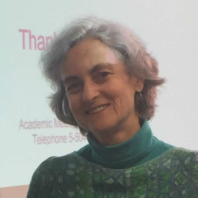 As an undergraduate, she pioneered the use of lead isotope analysis to identify ancient sources of metals; the research was published in Nature. Trained as an archaeologist, Dr. Goucher conducted archaeological and historical research in the Caribbean, Indian Ocean, and West Africa. She published widely in journals and books, including the 2nd edition of World History: Journeys from Past to Present (Routledge, 2013), translated into Korean, Chinese, and Portuguese. She was co-lead scholar on Bridging World History (2014), a $2.8 million project funded by the Annenberg/Corporation for Public Broadcasting project and broadcast on American public television stations. Her recent book Congotay! Congotay! A Global History of Caribbean Food (Routledge, 2014) examined Caribbean culture and cuisine from ancient to modern times and won the World Gourmand prize for best book on food and culture (Caribbean Category). She was co-editor of The Cambridge History Vol.2: A World With Agriculture (Cambridge University Press, 2015) and Striking Iron: Art of African Blacksmiths (Fowler Museum, UCLA, 2018), accompanying an exhibition that will travel to the Smithsonian Museum of African Art, in Washington, D.C., and the Musée du quai Branly, in Paris (2019-2020). She is editor of the four-volume reference work Women Who Changed the World (ABC-CLIO, 2020). Two other book-length projects are currently under review by university presses: Memory of Iron: Technology and Performance in the African Atlantic and Picnics and Porcupines: A Global History of Food in Michigan’s Upper Peninsula. In 2015, Candice received the “Pioneer of World History” prize, the highest award of the World History Association for lifetime achievement. In 2017, she was also recognized by the WSUV Chancellor’s Award for Research. In retirement, she looks forward to shepherding her final Ph.D. students to the finish lines, as well as writing, gardening, cooking, and traveling in the Caribbean with her partner Joseph. Dr. Berliner moved to the Palouse from Switzerland and has taught mostly Latin American History at WSU for 10 years. During this time she also co-authored four textbooks and designed new face-to-face and online courses. As a feminist, she has supported the Women’s Resource Center and volunteered in education for girls in the Palouse, under the aegis of the American Association of University Women (AAUW). After retirement, she plans to dedicate her energies to these institutions, as well as to continue extant research and writing projects. Family travel to Germany and Chile, for longer than just school breaks, will also be very welcome! She has been with WSU 31 years, and with the History Department since 1991. She feels that is best decision she ever made, and can’t believe how fast those years went! The people she worked with enriched her years at WSU, and she enjoyed being a part of their projects and careers and families. Her plan for retirement is to take time to enjoy the outdoors more and do lots of hiking—hoping to get back to NE Iowa and join her sister on her hikes. Her bucket is filled with places she wants to see, some out our back door and some out of the country. Lastly, she will spend time watching her two grandsons play football and basketball in their last years of high school. She hopes to take them zip lining this summer. Dr. Charles Weller was one of several international plenary speakers for the 5th Annual “Farabi Forum” at Kazakh National University (KNU, Almaty, Kazakhstan, April 3-4). Learn more about his time abroad! Dr. Orlan Svingen has been working closely with graduate students Jared Chastain and Laura Briere on a long-term project that has connected them to the 161st Infantry Regiment. Learn more in our News & Events section about their work on the project and multiple presentations at the Washington National Guard’s Camp Murray, located in Pierce County. Dr. Lawrence Hatter was awarded tenure this year after having been with the University since 2012. The American Library Association named Prof. Hatter’s book Citizens of Convenience: The Imperial Origins of American Nationhood on the U.S.-Canadian Border (Charlottesville, 2017) a Choice “Outstanding Academic Title for 2017.” Citizens of Convenience joins a prestigious list of only 500 books out of some 6,000 works reviewed by Choice in 2017. The American Library Association, founded in 1876, is the oldest and largest library association in the world. Dr. Peabody’s oral history project titled “Clark County Stories: How We Came to this Place” opened for community interaction and participation on January 27. Discussion revolved around the establishment of Clark County and the significant growth of the regional population. Learn more about the local research being done in Clark County in The Columbian and the Camas-Washougal Post-Record. 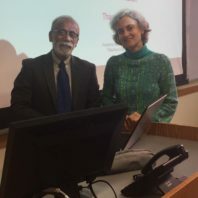 On October 9, 2017, Dr. Yvonne Berliner and her class in History 232, the Mexican Revolution and the Arts, hosted guest lecturer Dr. Francisco Manzo-Robledo from the WSU Foreign Languages and Cultures department. Prof. Manzo-Robledo spoke about the role of women in the Mexican Revolution, 1910-1920, as portrayed in Mexican films of the 1940s and ’50s. Students and professors engaged in discussion regarding differing gendered views of this historical event. Dr. Mercier’s cross-listed History/Women’s Studies 298 course was visited by author Michael Helquist this year. Students found fascinating Helquists’ book about the uncompromising radical physician Marie Equi. The fiery Equi was a professional woman in a man’s world, an open lesbian, a committed activist for the causes affecting women and workers, and was located in the Pacific Northwest! Dr. Aaron Whelchel was the Provost’s Featured Faculty Member for the month of October and was honored by WSU Vancouver Chancellor Mel Netzhammer and Vice Chancellor Renny Christopher.